Poor customer service is a salient reason why consumers aren’t loyal to businesses. True, today’s consumers are very demanding. It’s worth noting they’re demanding because they constantly encounter poor customer service. It’s a golden opportunity for your growth. Be aware that in most situations, a company’s advertising and word-of-mouth advertising must convey five positive messages before a consumer decides to buy. However, even if you provide the best products in your industry, consumers will flee for the hills if they’re dissatisfied by your customer service. That means your products cannot survive on their own. You must deliver on the promises in your messaging. Great customer service is a team sport. Your employees must perform professionally. When they do, you’re more likely to enjoy repeat business. 1. Inventory your customer service quotient. In other words, analyze your approach from the perspectives of your customers. This means asking yourself a couple of questions: Do my products meet my customer needs? Are the vast majority of my customer reviews favorable? 2. Create a unique customer-service vision statement for your Web site and collateral materials. A unique customer-service statement means you don’t focus on sales. It means creating a statement appreciated by your ideal target customers. Customers want to know that you get them – to provide them value – to make their businesses or lifestyles better and easier. Yes, customers like to save money. But first focus on delivering on values important to them – professional customer service, a pristine business image, great product or service utility, and convenience. After you cover these bases, then you can consider pricing. But for targeting ideal customers, don’t make cutting your prices your biggest priority. 3. Embed customer service qualities throughout your company. You must have a 100-percent customer-service culture. All persons on your team must understand the value of customer service. They must understand human nature and that your customers always make emotional decisions to buy. So your employees must be fully trained in exemplary customer service so that each customer has a memorable positive experience. 4. Evaluate your biggest competitors in customer service. Consider how they serve their customers. What makes them special? Them implement ways to improve on what your competitors do. 5. Develop benchmarks and performance indicators. Set high standards in these areas: Implement profitable pricing but keeps your customers happy; streamline your inventory practices for product availability; train everyone in customer service; become stellar in customer feedback; and develop a fool-proof system for solving customer complaints. Train all employees to treat co-workers as customers. 6. Focus on continuous improvement. Don’t ever rest on your laurels. Stay ahead of your competitors by analyzing your approach to business on a regular basis. Remember what’s worked for you in the past might be the reason for declining customer loyalty today. 7. Make customers part of your family. You will become customer-centric if you connect with customer inside and outside of your business. That means engaging them on social media. Be fresh every week. Announce contests and weekly deals to grab your customers’ attention. Look for opportunities to enhance your image. 8. Recognize and reward employees who excel in customer service. The trick is to make employees feel special. Incentivize employees with public recognition and rewards –those who make your customers feel special. Trending Essentials to Win Millennials’ Brand Loyalty — How do Millennial consumers — ages 18 to 33 — view brands? What’s necessary win their brand loyalty? The answers to these questions are important because Millennials have $600 billion to spend. If you win them over now — depending on your goods, services and industry — you might also create customers for decades to come. 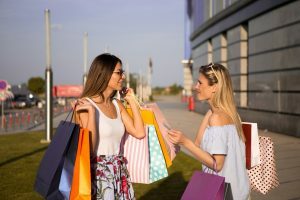 How to Profit from Word-of-Mouth Advertising and Customer Service — When was the last time you explored options for improving your word-of-mouth opportunities? Here’s a hint: Customer service is the No. 1 key to good word-of-mouth advertising and repeat business. My firm’s research shows that consumers usually respond favorably to marketing after receiving five positive messages. Conversely, they will divorce your company if they have five or fewer unfavorable experiences. 11 Sales Strategies to Outsell Your Big Competitors – Big companies have obvious advantages over small businesses. Their brands are well-known. They can afford sales training, sales-support staff and customer-relationship management software. On the other hand, there are good reasons why Cyber Monday has become big. In sales, it’s not what you say; it’s how they perceive what you say.